If you’re looking to build a new PC designed around Intel’s Z170 chipset, your decision on which motherboard to go with isn’t likely to be that simple. This is of course for a great reason: the selection of Z170 boards out there is incredible. The selection is even incredible on a vendor-by-vendor basis: GIGABYTE currently offers 26 models to choose from! Given the sheer selection, it’s a little hard to understand the differences between all of the boards, but fortunately, GIGABYTE offers a tool that lets you compare one board to another. 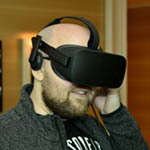 Where the Gaming 7 I’m looking at here is concerned, it’s designed to cater to gamers and offer a great number of features, but without going “overboard” by most standards. 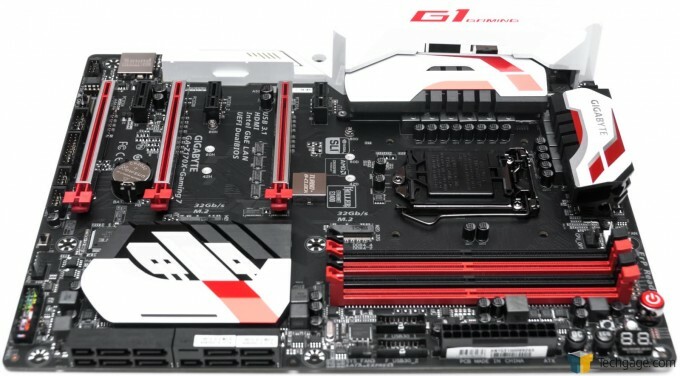 The Gaming 7 is the top-tier board in GIGABYTE’s lineup that’s numbered, but it has even higher-end offerings in the form of Gaming G1 and Gaming GT. The company’s Gaming 7 is priced at around $225, putting it in a rather comfortable spot for those building beefy gaming PCs. If you want to spend less, the featureset gets whittled down as far as the Gaming 3, which is priced at $130. Isn’t it great to have so much choice? Based on its name alone, I don’t need to tell you which market this board is targeted at. It’s a “Gaming” board because its audio and networking solutions are catered towards it, and not to mention the aesthetics. Also noteworthy is the fact that this board has a built-in TI Burr Brown OPAMP to deliver crystal-clear sound. As an added bonus, this OPAMP isn’t soldered onto the board, so you are free to swap it out for your own if your tastes tempt you to do so. If you’re using high impedance headphones, you can flick a switch beside the OPAMP to increase the amplification from 2.5x to 6x. This motherboard also includes dual Ethernet ports; one from Intel, and the other from Killer. While having two NICs is going to be unnecessary for most people, I’ve come to really appreciate having two in the rare event that one of them dies at some point – something I’ve experienced twice. Board top-right: Dual USB 3.0 internal headers, onboard buttons, and BIOS code LED. Board bottom-right: SATA ports and chassis connector headers. The GA-Z170X-Gaming 7 includes three x16 and three x1 PCIe slots. The 8-pin motherboard connector is conveniently placed horizontally at the top edge of the board. There's ample room around the CPU socket for a big cooler. A connectivity-rich panel: dual gigabit Ethernet ports and a Thunderbolt 3.0 port at-the-ready. Looking over the board, it’s not hard to keep spotting something new to investigate. At the top-right hand side are four buttons; two are for power and reset, while the other two are for enabling “ECO” or “OC” mode. These buttons will mostly benefit overclockers who use a test bench, although I’ve found myself relying on them a lot while troubleshooting in the past. One thing that helps this board stand out is the metal shielding surrounding the three x16 PCIe slots. This isn’t included so as to reduce signal noise, but instead to increase the durability of the slots. GIGABYTE says that this stainless steel helps the PCIe slot be 3.2x stronger in retention tests, and 1.7x stronger in shearing tests. I am truly not sure how needed a feature like this is, but I don’t hate it. Lining the CPU socket is an array of 10K "Durable Black" capacitors and 12 power phases. Buttons galore, and a BIOS LED for good measure. One of the board's two M.2 slots is found just above the top-most PCIe slot. The back of the board is clean, as expected, but ready to prick your fingers during installation if you are not careful. Accessories, including the I/O panel which plugs into the motherboard for some LED light action. Looking closer at the board, there are a couple of things worth pointing out. The “Turbo B-Clock” chip allows overclockers to break free from the Intel-imposed BCLK limitations of 5%, and instead gain the ability to adjust it between 90MHz and 500MHz. I think it goes without saying that should be enough for anyone. In the final shot in the above slider, you’ll notice something a bit odd about the I/O panel: it has a wire hanging from it. When installed, you can plug this wire into a special port on the motherboard which will enable configurable LED lighting – a great feature for those who love adding bling to their builds. With that, let’s see if the software bundle is as great as the hardware.